Graveside services for Mildred Wanda Lee Wood, 92, Willow Springs, Missouri, will be held at 2:00 p.m., Thursday, April 11, 2019 at Mt. Zion Cemetery, Olden, Missouri, under the direction of Robertson-Drago Funeral Home. 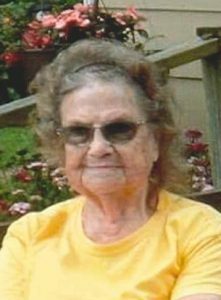 Mrs. Wood passed away at 7:40 p.m., Monday, April 8, 2019 at NHC Healthcare, West Plains, Missouri. She was born February 22, 1927, in Howell County, Missouri, to Letcher Burgess and Hazel Thelma Dollins Burgess. On August 10, 1946, she was married to Raymond Wood. Mrs. Wood was a homemaker and helped her husband operate a dairy farm. She enjoyed working in flowers, gardening, cooking on a wood stove for family and watching birds; her passion was quilting and embroidery. She loved, cherished and appreciated all of her grandchildren, great-grandchildren and great-great-grandchildren. Mrs. Wood attended Mt. Zion Baptist Church. She is survived by her husband, Raymond Wood; five children, David Wood and wife, Truda, Randy Wood and wife, Bonnie, Lee Wood and wife, Kay, Jerry Wood and wife, Wilma and Larry Wood and wife, Sandra; fifteen grandchildren; forty great-grandchildren; fifteen great-great-grandchildren; two brothers, James Burgess and Tommy Burgess; and several nieces and nephews. Her parents, her twins, Karla and Kyle, five brothers, Darrell, Roy, Charles, Dean, and G. W. Burgess and two sisters, May McAnally and Louise Myers, preceded her in death. Mrs. Wood will lie in state from 5:00 until 9:00 p.m., Wednesday, at Robertson-Drago Funeral Home. Memorial contributions may be made to Mt. Zion Cemetery and may be left at Robertson-Drago Funeral Home. We are so sorry for your families loss. You are in our thoughts and prayers. So sorry for your loss – remember Mildred from the feed store over the years. May God surround your family with comforting peace & love during this time of loss.